The Financial Crisis of 1971 was the culmination of a series of events that began during the early 1960s. Politicians set the gold ratio to the dollar at $35 an ounce that was decided in 1934 by Franklin D. Roosevelt. However, politicians have a vest self-interest in always pretending they do a good job. Unfortunately, they fight the business cycle to pretend that their policies and goals are correct. The first crack in this system was essentially the start of the 1966 Crisis. In 1965, the USA and most other nations stopped using silver for their coins. The value of silver had risen to a greater amount than the value of the coins. This was demonstrating Say’s opinion that nobody in their right mind would ever hoard money because it always declines in purchasing power. This long-term impact of constantly increasing government spending depreciated the purchasing power of the dollar and sent the value of silver and other free market items rising in a free market – unlike the fixed value of gold. This trend of a depreciating purchasing power of the dollar also manifested in rise in all assets from housing to share prices. People were ignorant of the cause as was the government. Nonetheless, the first serious financial crisis – the Panic of 1966 – erupted as the Dow Jones Industrial Index tested the 1,000 level for the first time post-Great Depression. Then came the pressure in gold. The governments were first forced to accept a two-tier market whereby gold could trade freely in London in 1968. 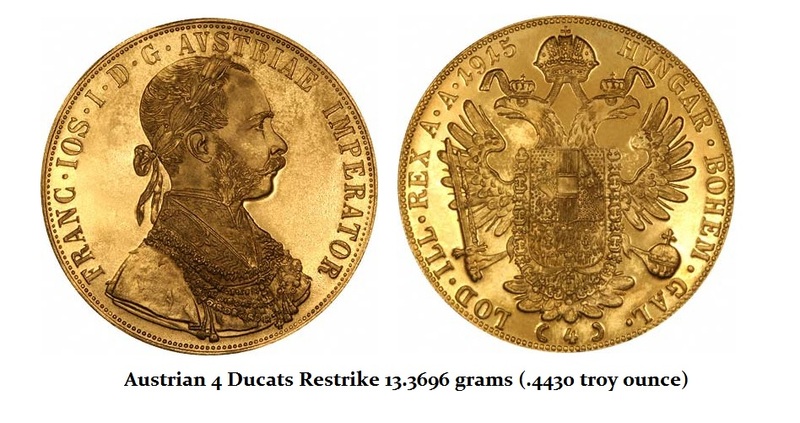 However, this was separate and distinct from the official gold standard price of $35 fixed among nations. 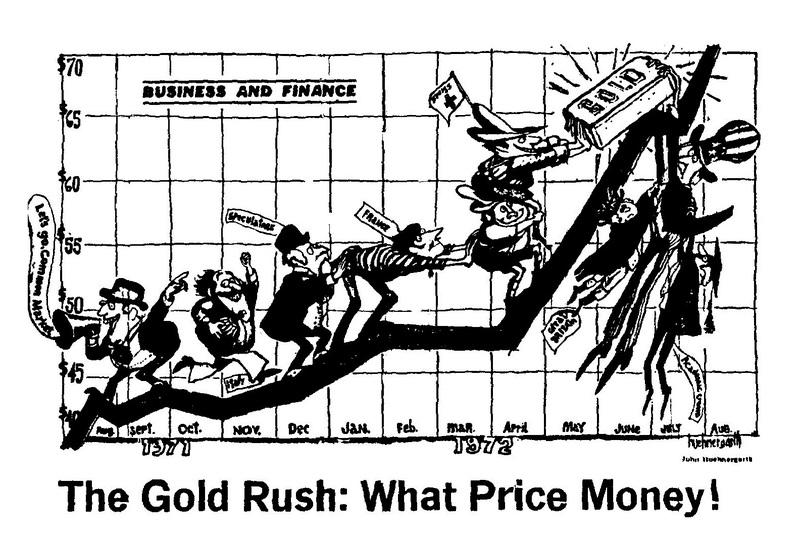 Gold rallied to $43.60 into April 1969 and then suddenly collapsed for 8.6 months into 1970 falling to $34.70 just below the official gold standard level. Thereafter, things began to unravel. Several countries began issuing “restrikes” that were dated 1947 or before to qualify as “collector” coins that were exempt for Americans to purchase. Mexico, Austria, and Hungary were the top sellers of these restrikes. Indeed, it was not until April 1st, 1971 that the United Kingdom lifted all restrictions on gold ownership with the USA following suit in 1975. 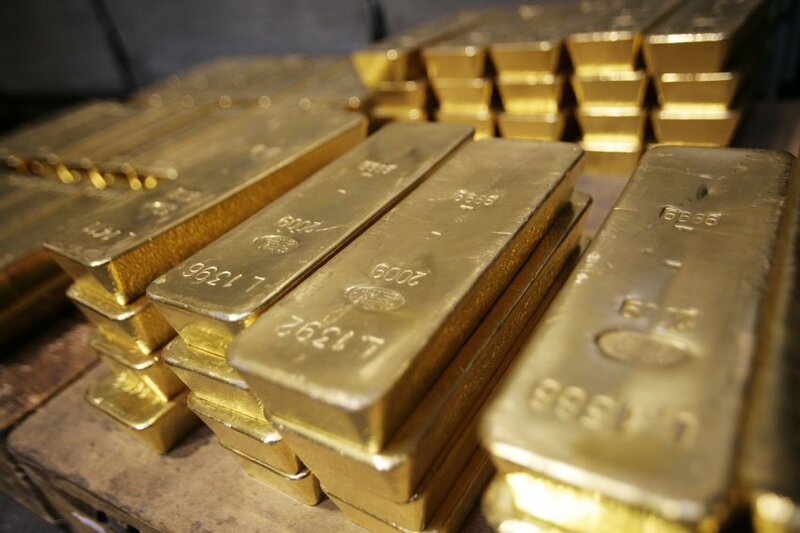 Consequently, despite the popular belief that Americans would rush out and buy gold in 1975 proved to be false since everyone who thought they should buy already had done so and contributed to the strong rally into 1969. 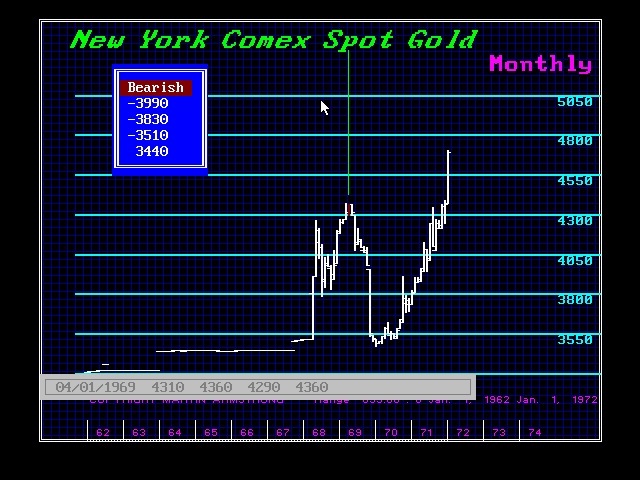 After gold bottomed under $35 in 1970, the argument was that there had been gangs of speculators playing against the dollar. 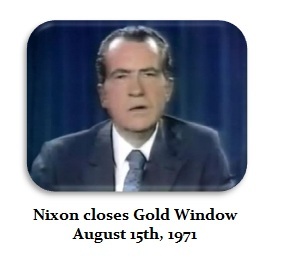 Indeed, the perception that President Nixon relied upon to close the gold window was precisely this concept of speculation. This is illustrated within this contemporary cartoon of the period. While February 1971 saw Apollo 14 landing on the Moon, Switzerland giving women voting rights in state elections only, and the new stock market index called the Nasdaq debuted, civil unrest was rising within the USA internally. On March 1st, 1971, a bomb exploded in the men’s room at the United States Capitol with the Weather Underground Organization claiming responsibility. On June 13th that same year, the New York Times began to publish the Pentagon Papers exposing the corruption and issue concerning Vietnam. There was a decline in confidence in the USA all over Vietnam that did more than merely induce protests involving some 500,000 people. The confidence in the dollar was being eroded at the same time. Confidence in the US was declining. On May 5th, 1971, the US dollar was aggressively attacked in the European currency markets threatening especially the Deutsche Mark driving it higher causing fear that trade would collapse. The central banks of Austria, Belgium, Netherlands and Switzerland all stopped the currency trading for they all feared a declining dollar would result in raising the cost of their goods thereby reducing their trade surplus. Things were changing. Britain began new negotiations for EEC membership in Luxembourg on June 21st, 1971. By June 30th, New York Times Co. v. United States was decided by the U.S. Supreme Court, which ruled that the Pentagon Papers may be published, rejecting government injunctions as unconstitutional prior restraint. Of course, those days are gone and now no US paper would dare reject the government position and the Supreme Court would see no barrier to to the loss of all our rights in the name of terrorism. It was in August 1971 that Camden, New Jersey erupted in race riots following the beating death of a Puerto Rican motorist by city police. Looting and arson exploded and this sealed the fate of that city as it never recovered becoming one of the poorest and highest-crime municipalities in the United States. Nevertheless, the Ides of August 1971 proved to be fatal for the world monetary system designed at Bretton Woods in 1944/1945. President Richard Nixon announces that the United States will no longer convert dollars to gold at a fixed value, effectively ending the Bretton Woods system. He also imposes a 90-day freeze on wages, prices and rents. Within three days, Australia and New Zealand decide to withdraw their troops from Vietnam on August 18th. The impact of the dollar declining sent ripples through the world economy as it exploded in third world countries that saw their citizens hoard dollars as a hedge against their own governments. Between August 19th and the 22nd, a right-wing coup ignited a rebellion in Bolivia. Miners and students joined troops to support president Juan Jose Torres, but eventually Hugo Banzer seized over. On the 26th of August, a civil government seized power in Greece and by September 3rd, Qatar gained its independence from the United Kingdom. Unlike most nearby emirates, Qatar declined to become part of either the United Arab Emirates or Saudi Arabia remaining independent. In Europe, on October 28th, the British House of Commons voted 356–244 in favor of joining the European Economic Community (EEC). The next month, the People’s Republic of China took the Republic of China’s seat on the United Nations Security Council on November 23rd, 1971. 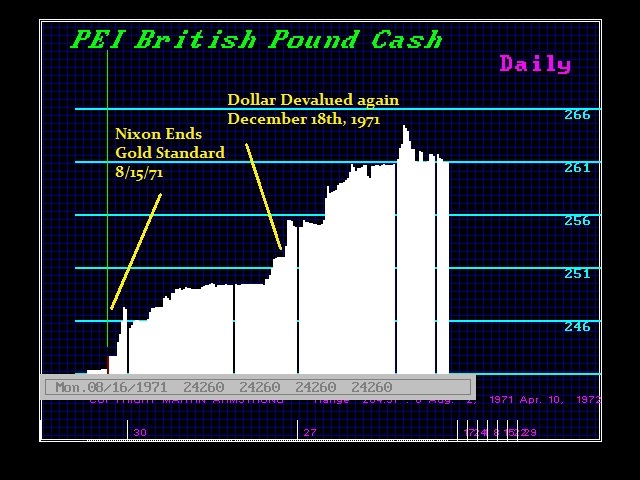 On December 18th, 1971, the pressure on the dollar forced a second devaluation. Hence, the financial crisis of 1971 was cause by the political refusal to recognize that the Marxist-Keynesian Agenda that would lead to a new world order where government do manipulate the global economy relieving them of all fiscal responsibility was over. Paul Volcker who in 1979 called this the age of “New Economics” that proved to be a complete failure in his piece – Rediscovery of the Business Cycle.